Technological advances and learning-by-doing have made U.S. shale oil profitable even at $55/barrel. Just 10 years ago, shale oil was expensive. Global oil prices spiked to $135/barrel in 2008 but shale oil didn’t and couldn’t respond. Now, at only $55/barrel, U.S. oil producers are going all in, announcing billions of dollars of increased investment, particularly in Texas and North Dakota, and energy experts like Daniel Yergin are expecting U.S. production to increase this year by more than 500,000 barrels per day or about 6%. This remarkable transformation is a perfect example of learning-by-doing. Cost reductions in solar, wind, and batteries get a lot of attention. But fossil fuel producers also learn from experience, and the pace of learning in U.S. shale oil over the last couple of years has been impressive. Recent research by Thom Covert and others help us make sense of what happened, and identify several key lessons for other industries. 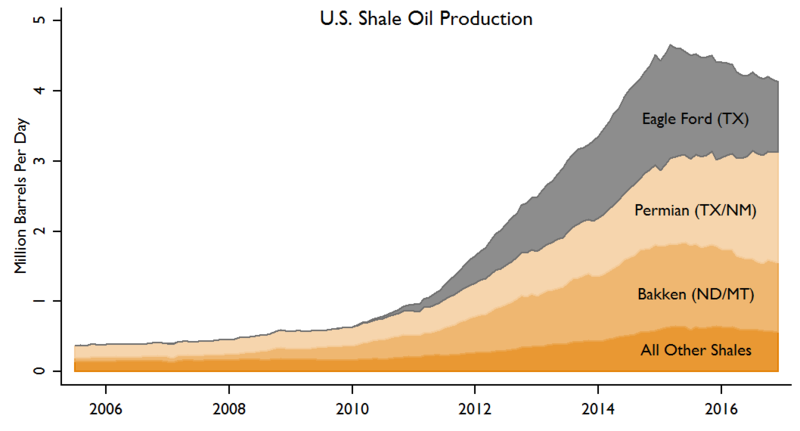 U.S. oil production in 2015 reached its highest level in decades, driven large increases in production from shale oil. 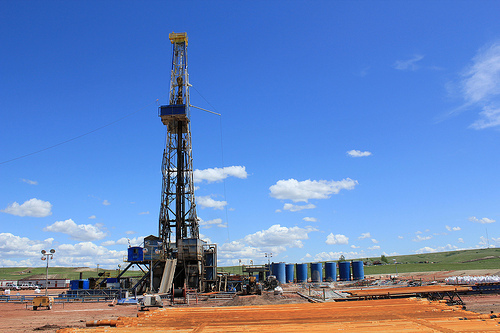 With shale oil and other forms of “tight oil,” producers drill horizontally and then use hydraulic fracturing to reach oil trapped in low-permeability rock like shale, sandstone and limestone. Over the last decade, these technologies have provided access to vast areas of oil reserves that were previously out of reach. The growth has been particularly dramatic in the Eagle Ford, Permian and Bakken, but other areas have grown rapidly as well, and shale oil now represents almost half of all U.S. production. Note: After slowing down in 2016, U.S. shale oil is expected to ramp up again in 2017, continuing a decade-long surge. Constructed by Lucas Davis (UC Berkeley) using EIA data. Production slowed in 2016 as oil prices briefly dipped below $30/barrel. Companies made severe budget cuts, reduced drilling activities, and U.S. oil production fell 12% between July 2015 and September 2016. Remarkably though, even at $30/barrel, production still continued at a solid pace. Despite historically low oil prices, the U.S. still produced almost 9 million barrels per day during 2016. Now with oil prices at $55/barrel, U.S. producers are pushing their chips to the center of the table. Hess, one of the biggest producers in North Dakota, just announced a $2.25 billion investment budget for 2017, up 18 percent from last year. Noble Energy has said they will spend up to $2.5 billion for 2017, up 67 percent from last year. Companies believe these investments will be profitable because U.S. production has become so much more efficient. Economists have long studied learning-by-doing. As a company makes more of a good, it tends to become more efficient at production. That is, the company learns to make output using fewer resources; or, equivalently, the company learns how to make more output for a given set of inputs. Learning-by-doing has been shown to happen in virtually all industries, with some of the best-known studies in economics coming from aircraft, semiconductors and shipbuilding. These industries may at first seem quite different from hydraulic fracturing, but there is a key similarity. In all of these industries, companies are performing a repetitive production process. Boeing builds hundreds of airplanes. Chesapeake Energy drills hundreds of wells. Key to learning is repetition, so industries like this are best suited to learning-by-doing. Note: Oil production in North Dakota’s Bakken shale. Tens of thousands of oil wells have been drilled in the United States since 2010. This repetition has allowed producers to experiment with innovative new approaches to drilling and finishing wells; new combinations of drilling fluids, well depths and other factors. This trial-and-error over thousands of wells has facilitated learning, pushing new techniques forward and reducing the cost per well. Not all markets look like this. For example look at building nuclear power plants. Nukes are such massive projects, undertaken so infrequently, that there is less scope for learning. Not surprisingly, studies have found only limited learning-by-doing for nuclear power plants. See here, here, and here. This is exactly the rationale for small modular reactors – proponents argue that in building much larger numbers of smaller reactors they can benefit from learning-by-doing and decrease costs. In the most comprehensive study to date, University of Chicago economist Thom Covert documents rapid learning-by-doing by shale oil producers in North Dakota’s Bakken Shale. Covert gathered detailed data from all oil wells drilled in the Bakken over an eight year period, including total oil production as well as information about the sand, water, and other “inputs.” Covert shows that over just a small number of years, producers learned to make much more profitable choices, squeezing up to three times as much profit out of a given well. One of the interesting patterns is that over time, producers have learned to be much more aggressive, extending the horizontal section of wells much farther and then using much more water and sand. By the end of the period, producers were using five times (!) as much water and three times as much sand per foot of horizontal length. This “super-size’’ approach has been adopted successfully with natural gas production as well. Super-size wells cost more upfront, but yield much larger amounts of oil and gas. Note: Reproduced with permission from http://home.uchicago.edu/~tcovert/, this map shows the expected returns from using additional water and sand. The black dots are the locations of actual wells. It is complicated, however. Covert shows that the optimal set of inputs varies dramatically across locations. The heat map above shows that some locations are much more suited to super-sizing than others. Using more water and sand increases production in some places (the red areas), while decreasing production in others (the blue areas). Learning-by-doing in U.S. shale oil is important not only for the United States, but also because of the prospects for global technology spillovers. The United States is not the only country with shale oil formations, and it would be naive to think these techniques will not quickly spread around the world. That said, there is an important feature of the U.S. oil and gas market that makes it particularly well-suited for learning. Unlike most other countries, in the United States there is a wealth of publicly available information. Regulators and third-parties collect and disseminate detailed data on each and every well drilled in the United States. Other countries hoping to grow their oil production would do well to adopt similar practices for information disclosure. Moreover, the United States has private mineral rights. This makes it possible for many firms, including smaller firms, to enter the market and try new drilling approaches. n contrast, where mineral rights are government controlled, it can be harder for companies to enter the market and we might expect there to be less experimentation. U.S. oil and gas production has long been characterized by ingenuity, innovation, and risk-taking — all typical of competitive markets. Still, it seems inevitable that these techniques will quickly spread around the world. Globally there are already an estimated 400+ billion barrels of tight oil reserves, so there are a lot of places where these techniques could be profitably employed. This means the global supply curve for crude oil will continue to shift outward, applying continued downward pressure on global crude oil prices.